The ACAF-PFS Fire Suppression Group designs, manufactures and distributes the automatic compressed air foam (ACAF®) systems for flammable liquid fire protection solutions. ACAF automatic fire suppression systems are proven to efficiently subdue flammable liquid fires in commercial, hazardous and industrial environments. Our compressed air foam systems are typically used for the oil and gas, power, aviation, mining and petrochemical industries. Designed to meet and exceed the most stringent industry standards, they are suitable for a wide range of applications, including chemical and fuel hazards, power generation and machinery pump areas, aircraft hangars and heliports, helipads, landing decks and oil storage floating roof tanks. 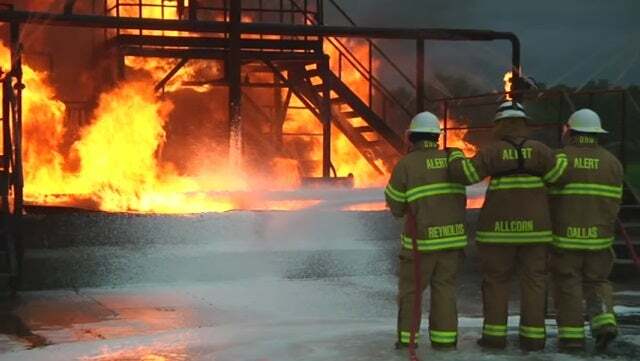 Firefighters, engineers, and building and vehicle owners / operators use ACAF® foam fire suppression systems to effectively suppress fires in industrial environments. All ACAF systems are engineered to meet and exceed the most stringent firefighting industry standards. ACAF Systems use environmentally safe, green compliant technology. They require 75% less water in comparison with traditional foam technologies, and have the industry’s only stationary CAF nozzle. The company adheres to ISO 9001: 2008 quality standards and American Society of Mechanical Engineer (ASME) certifications for all pressure retaining components. Pressure equipment directive (PED), Indian Boiler Regulation (IBR), Russian’s state union standard (GOST) certifications are also available on request. Our products, including ACAF Deluge and fixed water supply suppression systems, are approved and manufactured according to Factory Mutual Global’s specifications. Systems are warrantied for one or five years (offshore models carry a five-year warranty). They are distributed through a worldwide network of authorized distributors.